Well, we had a wonderful Christmas with family and friends, and now it's time to ring in the new year! I can hardly believe how fast time flies. It's scary actually. Each day is truly a gift, and it's up to us to make the most of every minute of this great life we are living. Tonight, we're staying in and celebrating a quiet New Year's Eve. Looking quite forward to it. We have a snazzy bottle of champagne (thanks Amy) chilling in the fridge, just waiting to be poured into some pretty champagne glasses. 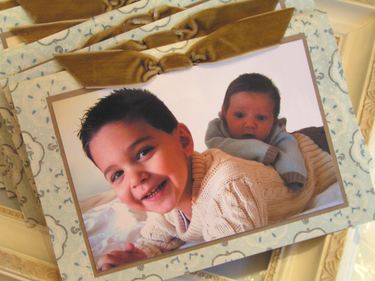 I'll be reflecting on the joy that 2007 brought: baby Sam, my new business, new friends, old friends, a loving husband, healthy children and a healthy extended family, all of you dear blog friends that I have had the pleasure of getting to know and so much more. 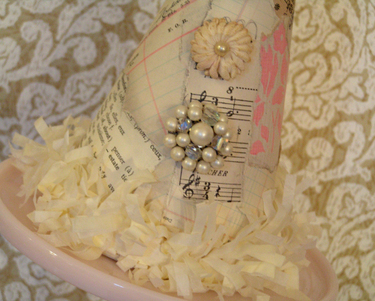 I made this collaged party hat a few years ago but never really finished it....never knew quite what to do with it. 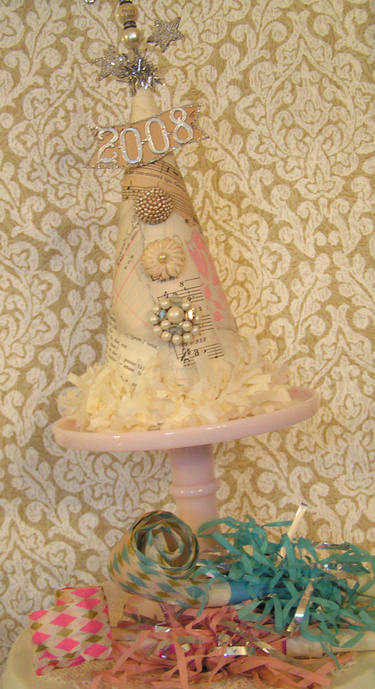 I was looking at it today and it occurred to me that I could fashion it into a New Year's Eve party hat! I added some more details and silver Dresden numbers and placed it on the buffet in the kitchen. Fun. Simple. Festive. These vintage party horns are a thrift store find. 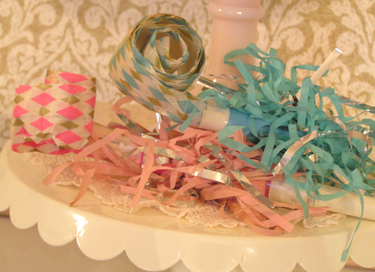 I am in love with the colors and the soft shredded tissue paper. Aren't they fun? Don't worry, I won't be using them, just enjoying their prettiness. I do use a lot of things from thrift stores and flea markets, but horns are NOT one of them! I'm looking forward to a new year and a chance to love more, worry less, meet new people, take new chances, think up fresh ideas, continue to watch my kids grow and learn and change, spread a little more joy, be the best me I can be, and eat less chocolate. That will be the toughest one for sure. I wish you all a happy and healthy 2008!!!! 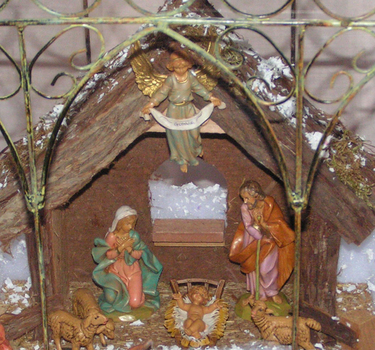 I wish you a peaceful and joyous Christmas surrounded by family and friends and laughter and love. As I type this I realize I haven't taken a picture of the entire tree yet. Oh well. You get the idea, right? I decorated it in a fairly simple way this year. 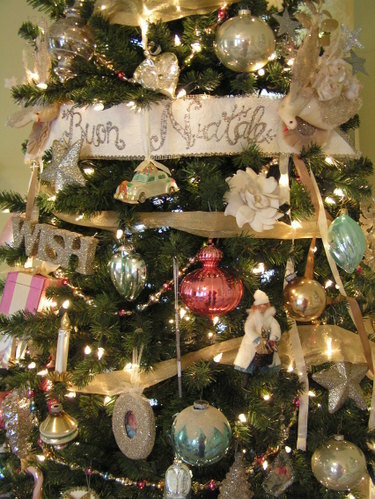 There are some strands of mercury glass bead garland and wide ribbon draped around the tree. 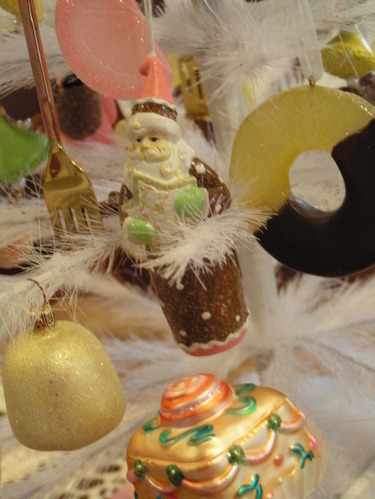 The ornaments are a combination of old and new. 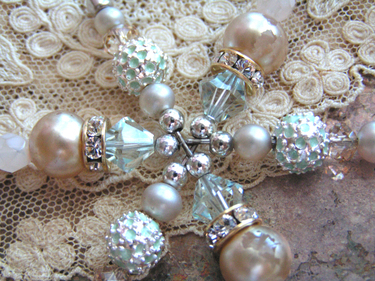 Mostly done in silver, gold, cream, pink and aqua blue. 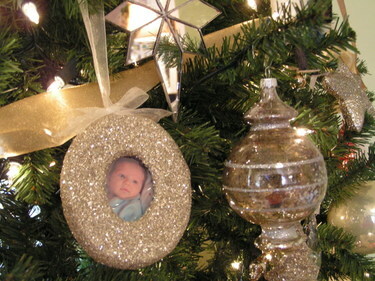 There are glass, mirrored, glittered, and fabric ornaments in the mix. I even tucked in some old millinery flowers here and there. Christmas trees are so special because every year they take you down memory lane as you look at the collection of ornaments from years gone by. I try and buy something for the tree every year to represent special moments from that particular year. 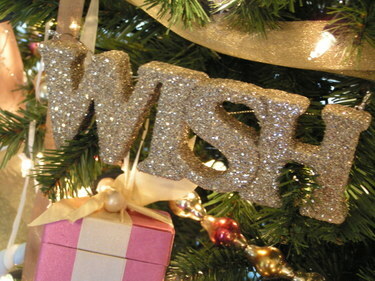 I bought this WISH ornament this year to mark the launch of my website. This car is one of my all time favorites. George and I found this sweet Radko ornament the year we were married. 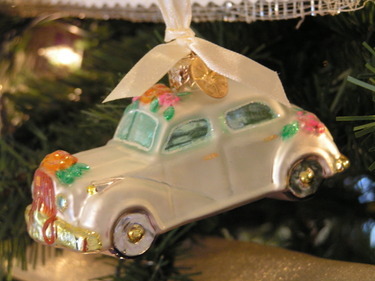 We rented an antique "getaway car" on our wedding day that was very similar to this one, so it was a perfect ornament for us to add to our collection in 2003! 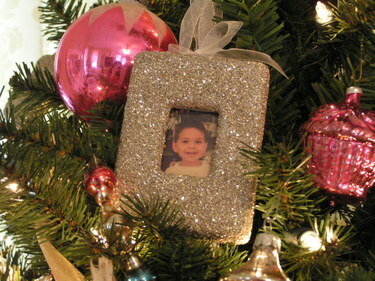 Here are the boys in glitter frame ornaments I found at Target. And I'm loving the mercury glass bulbs. 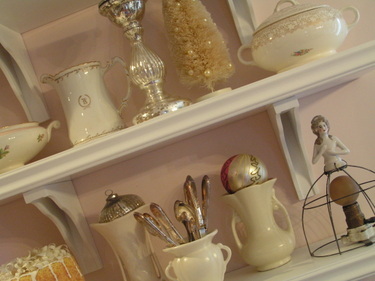 Do you see the little vintage cupcake below? I can't even remember where I got it, but I know it was somewhere in NYC when I was in college. And now, we're off to Ohio where we will spend Christmas with my parents, brothers, sisters-in-law, nieces, nephews, cousins, and grandparents. I'm praying for a safe journey without ice and too much snow. If you are traveling this weekend, I wish the same for you. Be safe, my friends. And enjoy these last few days leading up to Christmas! Now that our home is all decorated (about time! ), I walked around the house and snapped some more Christmas photos this week. 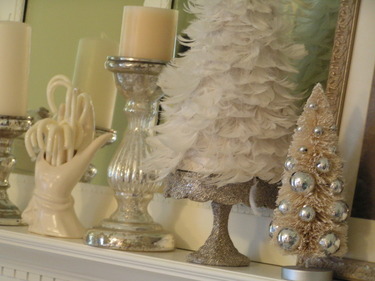 The photo above shows our mantle in shades of cream, white and beige. A mixture of old and new. 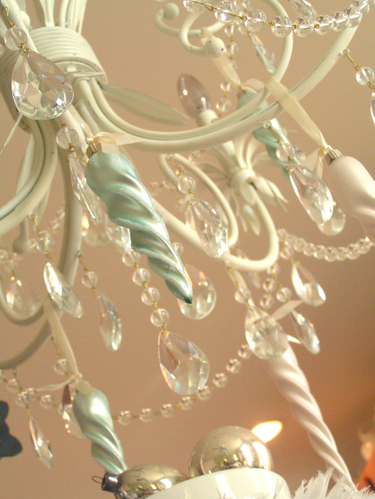 This is my favorite chandelier that hangs above our kitchen table. I simply hung a few sherbet-hued icicles from the arms. 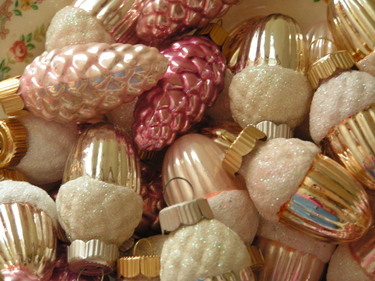 A bowl full of small silver, gold, pink and white glass pinecones and acorns. I just love these. This is sweet Mario at age one. I printed his picture onto transparency paper, cut it into a circular shape, rolled it up, and slid it inside a plain glass bulb. I got the the idea from an article in Somerset Studio a couple of years ago. 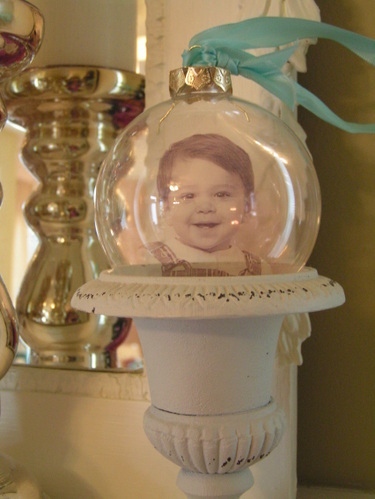 I made several of these that year and gifted friends and family with old photo keepsakes of loved ones. These are open shelves that hang in the kitchen. The vignettes are ever-changing. 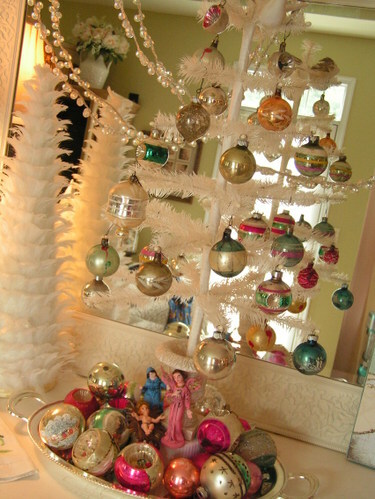 For the holiday season, I simply added some mercury glass, a few vintage bulbs and a bottle brush tree. Some of the mini glass bulbs I've acquired over the years hanging on a feather tree. And if you look closely you will see an old plastic Baby Jesus, Virgin Mary and Angel Gabriel that I found at Goodwill when I was in college. I had to scoop them up and take them home. I still have some pictures of the tree and another little tree I decorated for our bedroom. I'll post them tomorrow before we leave for Ohio. I hope you are all enjoying the Season and the love and joy that goes along with it all! 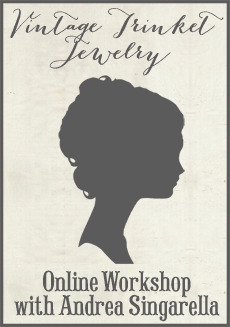 In between feeding the baby and wrapping gifts, I've been doing some simple crafting for the Christmas season. Emphasis on the word simple. 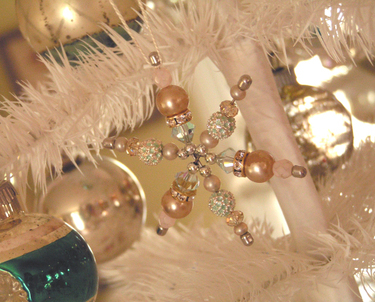 Here, I took a wire snowflake form and added beads to transform it into something beautiful. Some of the beads are new and some are old. Adding a few old pearls with that beige-ish chippy patina makes such a difference. 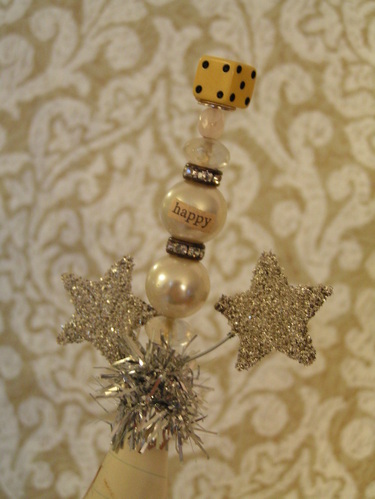 Then, I added a string and, voila, it became an ornament or gift topper extraordinaire! I don't think I can part with this one though. 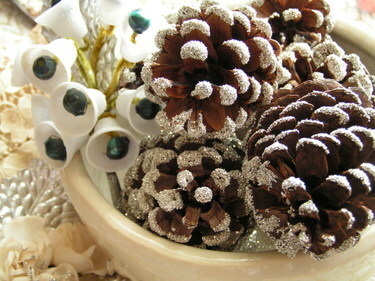 Below, I simply gathered some humble pinecones (which you can buy at the craft store for a ridiculous amount of money if you, like me, do not have any coniferous trees in your yard) and dabbed them with Elmer's glue and dusted them with my trusty glass glitter. I love the contrast of nature and sparkle. These will get tied to gifts this year for sure. And, how gorgeous would a whole wreath of these be?? That's a project for next year, I think. In the 80's, my mom used to make and sell pinecone wreaths. 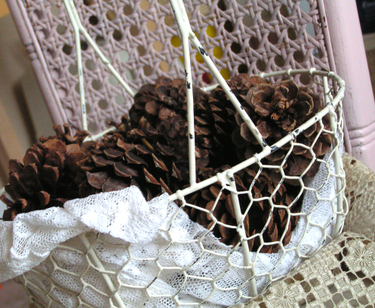 I remember boxes upon boxes of pinecones in our basement and hot glue and floral wire everywhere. I'll have to get the scoop on her technique when I see her next week! ...and I finally got one where both boys are looking in the same general direction and Sam is not sliding off of Mario's back! Whew! That was exhausting. Christmas cards are done! Now it's time to bake. 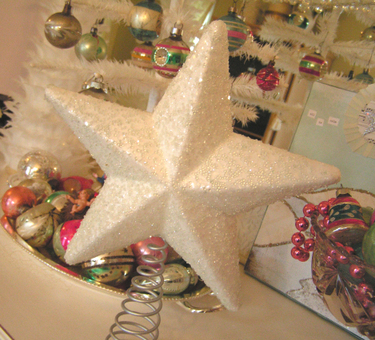 I've had this rather plain white star tree topper for several years now and have grown tired of it. So, unable to find what I wanted anywhere, I decided to give this one a makeover. First, I gave it a coat of Elmer's glue and dusted silver glass glitter on it. Good old Elmer's glue works as well as anything. No need to buy a lot of those fancy glues. I've tried many of them and am just as happy with Elmer's for most projects. 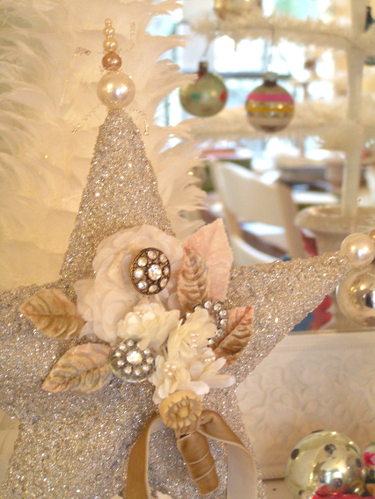 Then, I skewered some old pearls onto a triple pearl corsage pin and poked a pin through each point of the star. 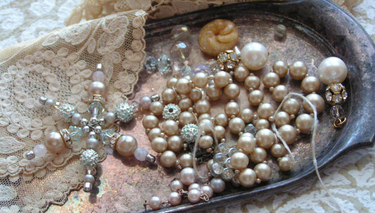 I twisted some silver bouillon coils around the pearls for a bit of whimsy. You can sort of see it in the photo above. 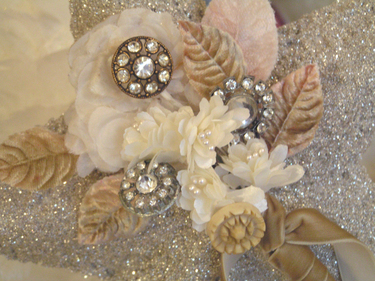 Next, I made a bouquet out of vintage millinery flowers, new flowers, rhinestone buttons and velvet leaves. I wrapped the stem in velvet ribbon and hot glued the whole bouquet onto the star. 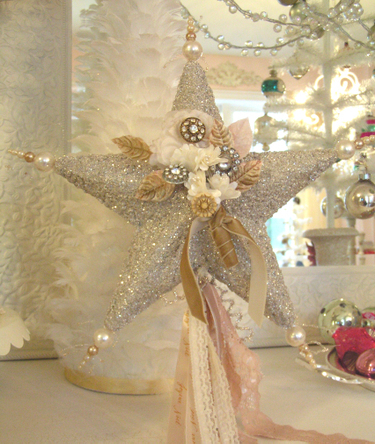 Then, I tied several lengths of ribbon to the base of the star. 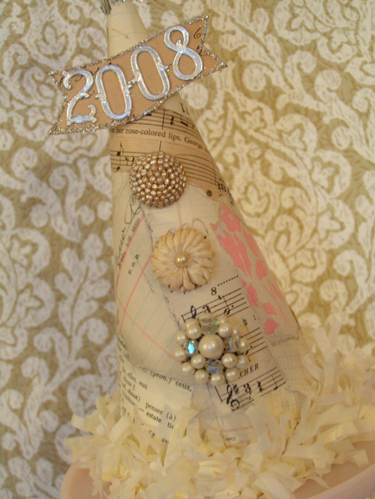 I used velvets, some old lace, and cream satin ribbon that has "Joyeux Noel" printed on it. I think it looks much better now, and it definitely compliments the rest of the tree, which I'll take picture of soon. It twinkles when the white lights hit it in the evening. Love that. In addition to the main Christmas tree that is decorated in the family room, I like to decorate smaller trees throughout the house. This is the Sugar Plum tree. It sits on the old chest we use as an island in the kitchen. 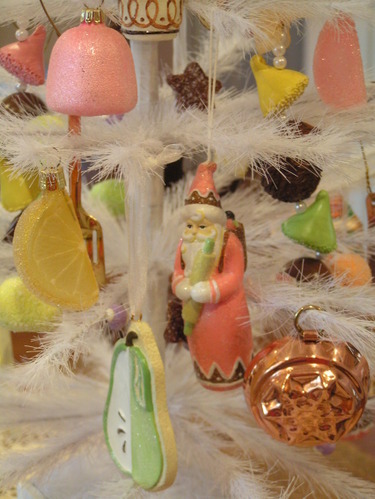 All of the ornaments are sweet treats or baking supplies including little copper spatulas, gumdrops, petit fours, mini copper tarte pans, iced sugar cookies, and chocolates. Yum, I'm getting hungry just looking at the photos! Isn't the little Baker Santa adorable? And I love the glass petit four complete with paper wrapper. And the chocolate dipped fruit, oh, I could go on and on! 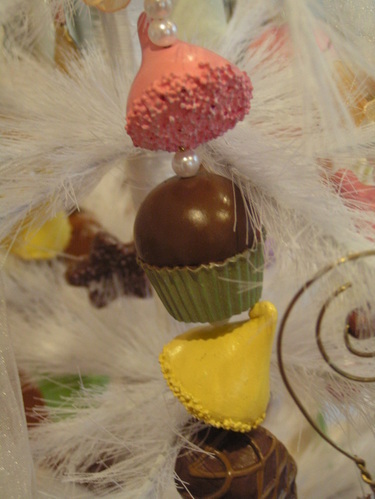 I have a sweet spot for confections and I love to bake so this tree is an annual favorite to decorate in the kitchen. Don't these look good enough to eat? I've been trying to stay away from sweets and shed this extra "baby weight", but now I seriously want a box of good chocolates! My will power is mediocre, at best. Ok, I admit, I have no will power. Who am I kidding? So, as I said before, George and baby Sam share the same birthday. This year was a big one for George...he turned 40! I knew that with the baby coming, the timing would be way off to celebrate on his actual birthday (boy, I was right about that!) 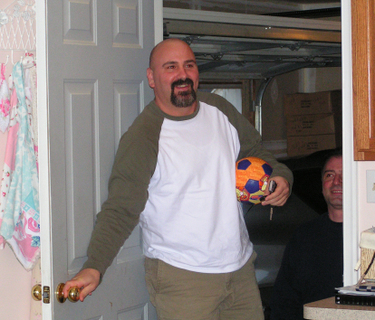 So, I decided early on to throw him a surprise party a few weeks after his birthday. I certainly couldn't let this one go without a celebration! Back in September, I made the (hilarious) invitations that featured his high school senior picture. Let's just say he had a whole lot of hair back in 1985! The messy shaggy hair thing was popular back then. Not a good thing, I must say. 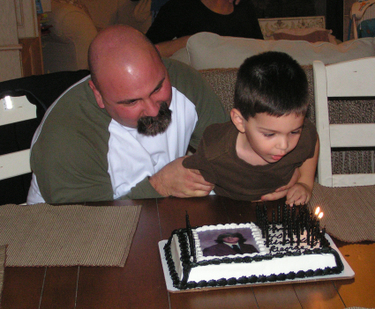 Then I ordered the cake with the same picture on it. You can see it a little bit in the photo below. I know how much he hates that picture, so of course I had to use it! As it turns out, he was very surprised and had no idea that I had been planning this for months! His friends came from near and far to help us celebrate and stayed until all hours of the night. It was a lot of fun to watch him mingle and laugh that evening. I hope the memories of this birthday will stay with him for years to come. He's 40 now, but has such an incredibly youthful persona. In fact, his childlike spirit is one of the qualities I love most about him. He will always be young at heart. He lives each day with passion. That's something he teaches me everyday and probably doesn't even realize it. There is no day like today. Live it up. Take the chance. Give lots of hugs. Love. Love. Love.